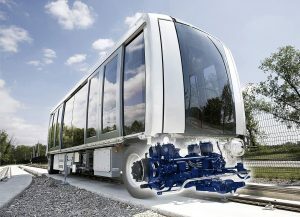 A new generation of bogies forms the core of the Texelis display at InnoTrans 2018 being held in Berlin from 18 to 21 September. On stand 319, in Hall 20, Texelis is showing how it has developed from being a supplier of axles and drives for rail transport into the leading supplier of innovative mobility systems for APMs, metros and trams. “This is a big step for Texelis and part of our strategic plan to move from being a supplier of components to becoming a key partner for a critical part of the rail vehicle,” said Jean Vandel, Director Business Development at Texelis. “The development demonstrates our ability, based on 60 years’ experience, to provide complete systems, not just components. We are significantly reducing the risk for the operators, as they can bank on proven, reliable, cost efficient and innovative Texelis solutions, some of which offer as much as 1 million kilometres in between overhauls,” added Mr Vandel. Texelis solutions are based on a deep understanding of the requirements of the railway industry, with many axles still in service after 30 years. A core element of the design stage has been to ensure low life cycle costs, and this has been built into more than 15,000 axles and 5,500 gearboxes currently in global use. The company has demonstrated its commitment to long term support and can provide full MRO, upgrading and re-engineering, in-service preventative maintenance, obsolescence management and comprehensive training solutions.